Bet you’ve never had Lemon Ice Cream! 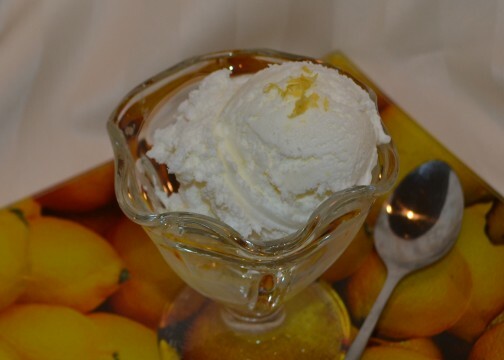 Not lemon sorbet, or lemon sherbet, or lemon granita or lemon frozen yogurt, but lemon ice cream–creamy, rich, sweet, intense lemon ice cream. Intrigued? Tempted? I hope so, because I have a simple, oh-so-good recipe for you. You do have an ice cream maker, right? I use a “frozen bowl” ice cream maker, which seem to be everywhere for $40-$50 now, but sometimes you can get lucky. This weekend my friend Sharon bought one at a garage sale for $5, and I saw one at Savers for $12.99. Homemade ice cream is very, very rich, and Lemon Ice Cream is no exception. Serve small scoops (with an option for seconds, of course). This recipe makes a quart of ice cream, richer and more filling than even the most premium commercial ice creams. One quart of this ice cream will serve as many people as a half gallon of that store bought stuff. I like to serve this ice cream on fruit pie, crisps and cobblers. My friend Sharon, whom I mentioned above, bought her ice cream maker after I fed her berry crisp with a scoop of this lemon ice cream. This ice cream is also fantastic as a filling for an ice-cream sandwich. To make a truly gourmet ice cream sandwich place a small scoop of Lemon Ice Cream between two ginger cookies, squish the sandwich a bit, square the filling up a bit, maybe roll the sides in a bit of chopped chocolate-milk, semi-sweet or white, then put the little bites of heaven in the freezer to firm up. My pregnant daughter likes to eat Lemon Ice Cream “as is” straight from a glass bowl with a long spoon. She downed the sample above in one breath (at 9 o’clock in the morning one week before her due date!). This recipe was first published in Gourmet magazine in 1999. I’ve been making it since May 25, 2003. Yes, I marked the date on my copy of the recipe, with this note, “Delicious and simple!” “Simple” was written in caps and underlined twice! With a vegetable peeler or microplane remove the zest from the lemon, do NOT include any of that bitter white pith in with the zest. Put the sugar and the lemon peel in a food processor or blender and whirl until the sugar is finely ground and the lemon zest has been incorporated into the sugar. Add in the milk and the cream (On occasion, I have used 2 cups half-and-half instead of the milk and cream mixture). Blend just to combine. Stir in 1/4 cup freshly squeezed lemon juice. Process in ice cream maker for about 20 minutes. Place soft ice cream in a freezer safe bowl, and set in freezer to harden up a bit (a few hours). Ice Cream will keep at least a week, if not more, in the freezer but I doubt you will have to test the outer limits. Thanks for stopping by my kitchen today! Looks like the next few days are going to be scorchers. Stay cool. Squeeze lemons. Make ice cream. By the way, I think the picture above is one of the best so far for this blog. 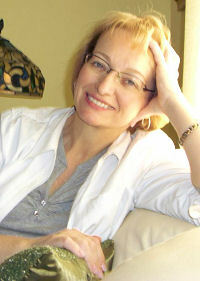 My webmaster, Ratty, fixed it up real nice, didn’t she?